Unique-Desire: Monster High Collaboration "Frankie Stein"
Hi guys!! I am soooooooo excited to show you guys this!! I teamed up with some of my favorite bloggers to create this awesome Collab of Monster High Characters!! If you don't know, Monster High are a series of Dolls for young children, and they have a YouTube mini series you can find here. Dont forget to check out the other girls look!! They are sick! "Frankie is only 15 days old. 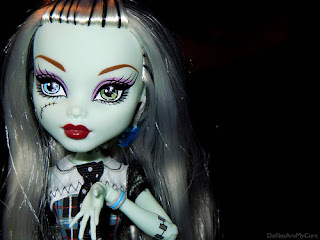 She has mint green skin, stitches, and bolts, and is new to Monster High. Her pet is a puppy named Watzit. Frankie is very friendly and athletic, but has a clumsy streak, as her body parts tend to fly off." Now onto the look!! We all decided to take literal interpretations of the dolls(as you probably have already figured out), so they are really perfect for Halloween(yes the sell Monster High Costumes!). This look took FOREVER! Mostly just to paint my face green haha but OMG sooo much fun!! So I hope you guys enjoyed this Collab as much as I did!! Seriously don't forget to check out the other girls looks!!! WOW! This is stunning, girl! I love looove your lip color. You're absolutely amazing. I really lovae it!! How did you get your face that color? I also want to know what you used for your face. xD These looks are really fab, you ladies did a great job. Stunning! This is one of the funnest (is that a real word?) collaborations I've seen. Girl, you lookin good for being only 15 days old! This was lots of fun, so happy we finally got to collab! Well done! That looks awesome! Awesome job! All 4 of you look amazing. you guys make such a good team! love all your looks! gosh I'd imagine you had fun doing this!! Love that you took the look so far with make up on the neck and all. And the purple eyeshadow to a green face was awesome. Good thing to remember haha!!! Hello, I wonder how you did the green base of Frankie? Nice makeup! I would love to learn how to do that! I like it! Your post is really good providing good information. I liked it and enjoyed reading it. Keep sharing such important posts.I am very much pleased with the contents you have mentioned.I wanted to thank you for this great article.I enjoyed every little bit part of it and I will be waiting for the new updates.I really appreciated this post.Just want to say thank you for the information you have shared. Just continue writing this kind of post. Thanks. Where can I go to do 6little monster high. Fans for a birthday party for my 11 years old.we live in riverside calif.